Here’s a PowerShell script we recently wrote to show the source path location for all the content that we put into ConfigMgr. The Script lists all the content source paths for the following CM objects. The output is as shown in the example below. before executing the script, connect to your site. Thanks to Claude Henchoz for helping me out with the the Applications function. I realize that this post is almost a year old but what version of SCCM 2012 did you write this against? R2, SP1, etc? I’m asking because I tried running this against our SP1 install and ($Application.SDMPackageXML).AppMgmtDigest returns nothing. Hi, i wrote this when we had 2012 sp1 in place, meanwhile we run R2 , but haven’t tested it there yet. 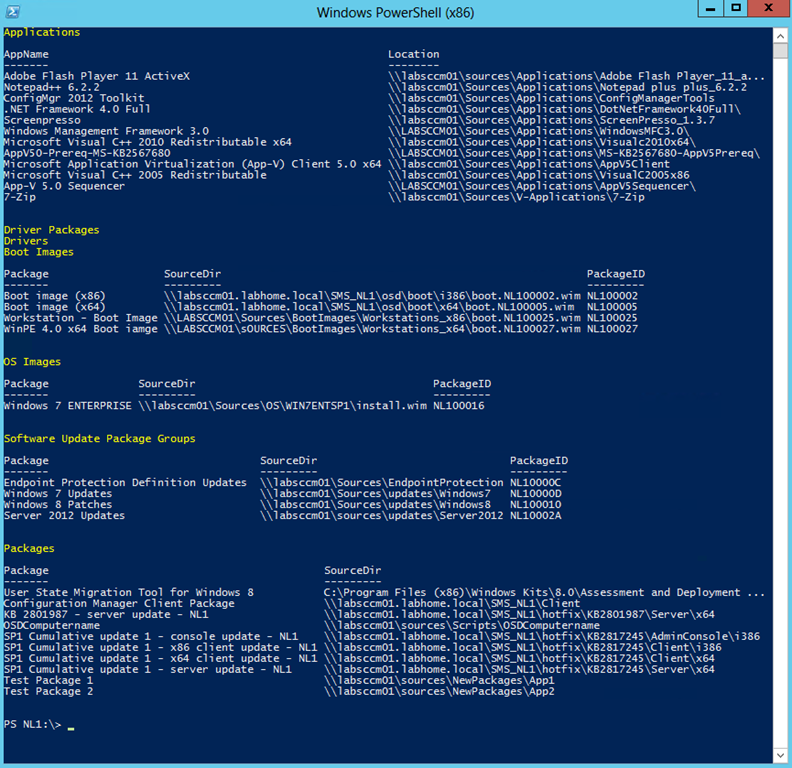 I’m getting a lot of errors when trying to run the above powershell script. Syntax errors, like, “Missing ‘)’ in method call”, and “Missing closing ‘}'”, stuff like that. I’m trying to run this on Server 2012 w/SCCM 2012R2. Is there something I’m doing wrong? Replace " with double quotes. Had the same problem as Matt; looks like the text of script changes a single quote ‘ to ". Find " and replace with ‘ (there are a lots of them!) and all will be OK. And running it on 2012R2 with SP1 + CU1, so ‘latest’ works OK.
Nice script though otherwise. Thanks! There is no singel ( ‘ ) or double ( ” ) quotes to find. What do I need to change to make the script run? Clearly the person who posted this blog was too lazy to simply upload a text file to a storage site, so people dont have to mess around trying to account for all the issues that this bloging website cause with scripts. Can someone please clarify what is needed to make this script work???? Unexpected token ‘&’ in expression or statement. If someone could improve the script to format output as a table to simply insert in Excel and filter, that would be really appreciated. Currently when I insert its output in Excel, it puts everything in the same first column. Great script just what i needed, thanks!